Female students interested in playing rugby might soon be able to sign up for the sport at Wits University. This past Saturday, April 21, was the first time Wits played host to a women’s sevens tournament at its Braamfontein main campus. The competition, held under the umbrella of University Sports South Africa (USSA), attracted 15 teams, and was held with the goal of attracting female students to play rugby at Wits. Charmaine Lukalanga is eager to join a new Wits women’s rugby team. Photo: Sanet Oberholzer. Rugby sports officer at Wits Sport, Amigo Ngcakana, said Wits rugby is in the process of setting up a women’s rugby team which they hope to implement in the second semester. “We want to see a bigger representation of women in sports, specifically in rugby,” added Ngcakana. “I got here three years ago. I feel that the rugby club is now at a stage where it can start marketing itself and I can start focusing on other things. The next stage is to implement women’s rugby. Hopefully in a couple of years we’ll have rugby bursaries for women to come to Wits,” he said. 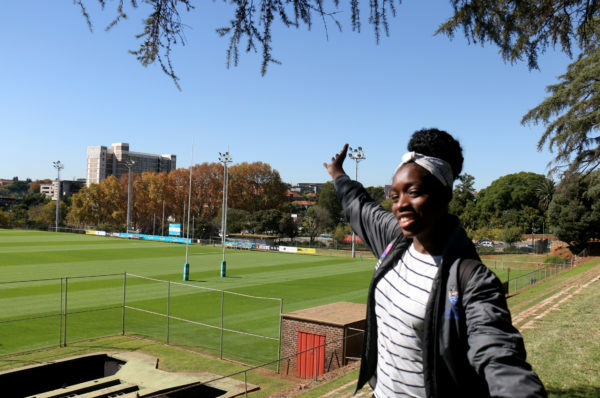 First-year computer science student, Charmaine Lukalanga, has been pushing for a women’s rugby team to be formed at Wits since the beginning of the year.